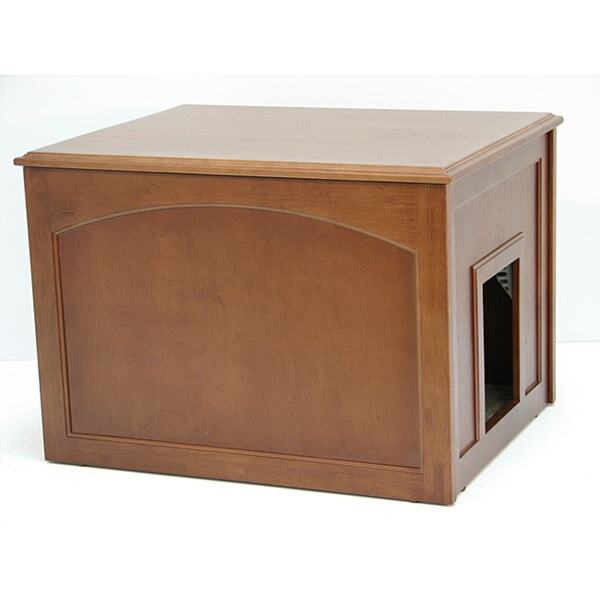 Give your furry little buddy the perfect home of his own with this durable and safe box furniture. The hinged top access helps you to keep the crate clean easily and the mahogany color adds beauty and versatility to this beveled box. Great potential, no follow through. The quality looked good when I emptied the box. It was well packaged. When I got to the last pieces in the box - the carpet and the bottom of the box, I was so dissapointed. The lid has attention to detail (nice hinges and hinge to keep top from falling down when open) but the bottom won't hold anything! It is like the bottom of drawers - thin board that will in no way hold a cat litter pan with 40lbs of cat litter, let alone with a 15lb cat. If it does, it won't be for long. The sides are held to each other using simple brackets. For the price of this unit (more than I paid for a large 53" cabinet with 3 drawers and a door!) why did they cut this most important corner. I put it all back in the box and I'm shiping it back. Unless you have a tiny pet, don't buy. Love, love this cat box. Wonderful to have a litter box that looks like a quality piece of furniture. Easy to put together and functional. Would recommend this to anyone. Great product and price point. Arrived just before 9 am. I had it in the house, unpacked and put together before 10 am. Very simple instructions and everything fit nicely. It looks great! One cat had to investigate it before I even got the litter box in it. It's easy to clean. Very little tracking due to the carpet inside, and the dog can't get to the litter box. So happy to have made this investment. I bought the dark cabinet for myself and this one for my daughter's cats. We both really like how easy it is to lift the attached lid to clean the litter tray. Just as described and just what I needed! Looks really nice, and was easy to put together. A little expensive for something made of heavy particle board, but very happy with the way it looks. Cats are using it with no problems. It is attractive and seems to be well made. The reviews were good and I need something like this in my new home. Hello Valued Customer, I hope your day is going well. It is a particle board made from paper and melamine glue. It surface is closed and resistant to scratching to name a couple. Thank you for shopping with us. "What are the interior dimensions?" The dimensions are 24.5 inches long by 19.6 inches wide by 17.5 inches high. The door is 7 inches wide by 9 inches wide. "what is the bottom made of ?-I saw that some of these products have a nice cleanable melamine bottom, is this?" Yes, the bottom is made of melamine, which is easy to clean.